But, in general, it’s all the same thing, data in the cloud tied to mobile devices that will allow AR devices to become the gateways for our avatars in this new landscape of reality layered with virtual interactive information. So while many are talking about the AR cloud in the coming months and years as being enhanced by 5G speeds and amazing AR applications, ultimately, there is only one product feature that will be the most valuable differentiator: trust. The AR cloud that can best sell privacy and security is the AR cloud that will rain on all the others, and compel us to seek shelter within a trusted, secure, and convenient virtual space we carry with us everywhere. This fall students at the University of Michigan will have a new way of getting around campus. Two self-driving shuttles will cover a nearly two-mile route — a first on any campus around the country. The project is a partnership with Mcity, a 32-acre testing facility on the campus where tech startups and automakers research self-driving vehicles. Mcity Director Huei Peng joins Here & Now’s Robin Young to talk about the shuttle project. VR & AR make headway in courses on health care, art history, and social work [Roll] Plus…a $200 wireless VR headset from Oculus in 2018? Virtual and augmented realities make headway in courses on health care, art history and social work. When Glenn Gunhouse visits the Pantheon, you would think that the professor, who teaches art and architecture history, wouldn’t be able to keep his eyes off the Roman temple’s columns, statues or dome. But there’s something else that always catches his eye: the jaws of the tourists visiting the building, and the way they all inevitably drop. There’s only one other way that Gunhouse has been able to replicate that feeling of awe for his students short of booking expensive plane tickets to Italy. Photos, videos and even three-dimensional walk-throughs on a computer screen don’t do it: It’s when his students put on virtual reality headsets loaded with images of the Pantheon. …nursing schools are using virtual reality or augmented reality to bring three-dimensional anatomy illustrations off of two-dimensional textbook pages. Facebook is set to reveal a standalone Oculus virtual reality headset sometime later this year, Bloomberg reports, with a ship date of sometime in 2018. The headset will work without requiring a tethered PC or smartphone, according to the report, and will be branded with the Oculus name around the world, except in China, where it’ll carry Xiaomi trade dress and run some Xiaomi software as part of a partnership that extends to manufacturing plans for the device. 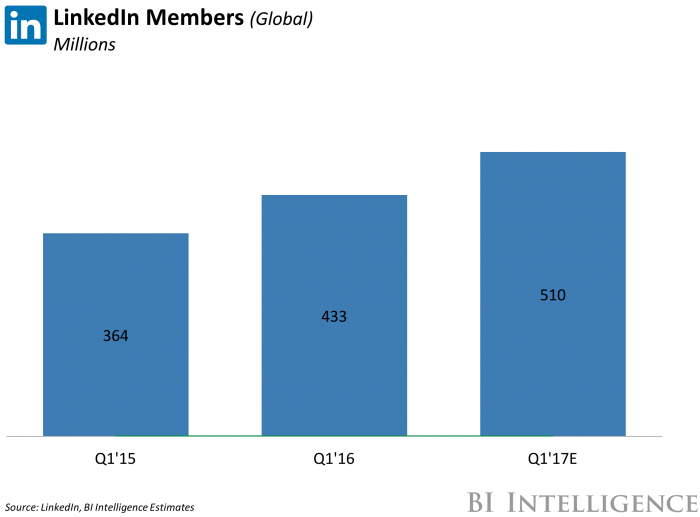 LinkedIn announced that it now has over 500 million registered users in 200 countries, an increase from the 467 million reported in the company’s last earnings release as standalone company in October. Microsoft’s $26 billion acquisition of the professional social network was completed in December, and similar announcements highlighting tighter integration between Microsoft and LinkedIn could be imminent. The member milestone is important, but somewhat lackluster as it implies relatively flat member growth since Q3 2016. It’s owned by Microsoft — and with the increasing usage of artificial intelligence, algorithms, and software-based screening, look for Microsoft to offer more services in this regard. New forms of badging, credentialing, and blockchain-based applications could arise in the future…and having your account on LinkedIn might help in this regard. Looking to build a home? A learning space? Or move into an apartment across the country? How about a VR-based look around first. The use of virtual reality in industries such as architecture, construction, and real estate is growing. Below are some articles that speak to this trend. In the future, it’s highly likely we’ll be able to get a nice VR-based tour of a space before building it, or renting it, or moving into it. Schools and universities will benefit from this as well, as they can use VR to refine the vision for a space with the appropriate stakeholders and donors. 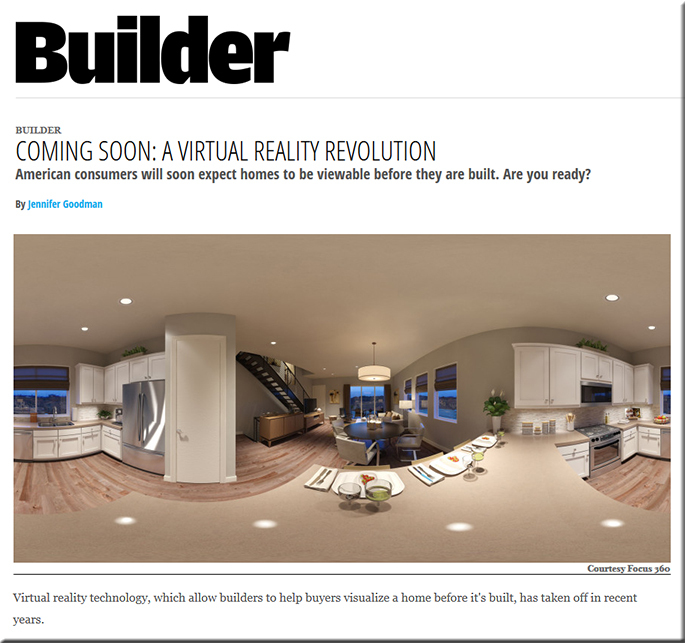 American consumers will soon expect homes to be viewable before they are built. Are you ready? In what ways are builders using VR today? There are two primary uses of the panoramic style VR that I mentioned above being used: 1) photography based experiences and 2) computer generated (CG) experiences. The former is getting quite a bit of traction right now through technologies like Matterport. They are what I consider a modern version of iPix, using a camera to photograph an existing environment and special software to move through the space. But it is limited to real world environments. The CG experiences don’t require the environments to be built which gives builders a huge advantage to pre-market their properties. And since it is computer generated, there is a tremendous amount of flexibility in what is presented, such as various structural options or cabinet selections. And not only homes! Developers are using the technology to market the amenities of a new master planned community. While 3D modeling and online virtual tours have become more commonplace in the home design industry, at least one local builder is taking the custom home building and buying process into a new dimension. At a recent preview event for this year’s Homearama, an annual home design showcase to be held this May at Chesterfield County’s NewMarket Estates, Midlothian-based Lifestyle Home Builders let attendees virtually walk through and look around a completed version of the house it is building – while standing within the same unfinished home under construction. Participants were invited to wear virtual reality (VR) headsets for a full immersion, 360-degree experience, or they could navigate the finished product via a virtual tour on a computer screen. LifeStyle is using the technology, which it adapted from building information modeling (BIM) and off-the-shelf software, to allow homebuyers a chance to see their custom home before it is built and make any changes prior to construction starting. Agents have to manage the time it takes to go from one visit to the other, dealing with traffic among other elements out of their control. Virtual reality can help immediately resolve both of these issues. 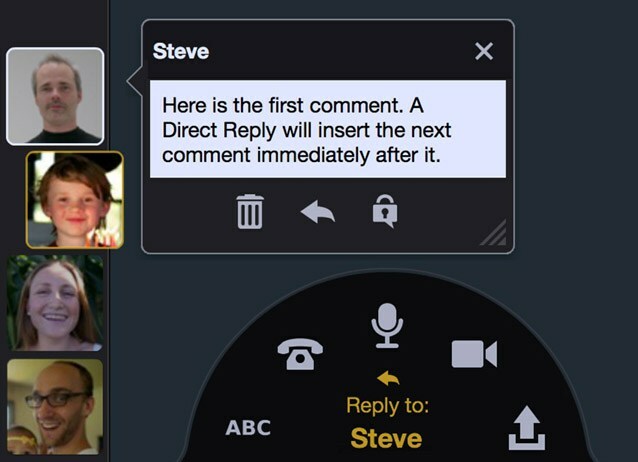 It offers the possibility to virtually visit a lot more homes in a lot less time. This will naturally increase sales efficiency, as well as allow the ability to see more potential buyers. On the more positive side, AI could take over mundane, repetitive tasks and enable the workers who perform them to take on more interesting and rewarding work. But that will also mean many workers will need to be retrained. If you’re in a business where AI-based automation could be a potentially significant disruptor, then the time to invest in worker training and skill development is now. One could argue that AI will impact just about every industry. For example, in the financial services industry, we have already seen the creation of the robo advisor. While I don’t believe that the robo advisor will fully replace the human financial advisor because of the emotional aspects of investing, I do believe that it will play a part in the relationship with an advisor and his/her client.